We offer a full roofing service from repair to replacement, and new builds. We are also specialist Velux roof window installers. Sometimes the life of a pitched roof can be extended by simple maintenance. Over time the rendering can become loose and fall out which can result in water penetration due to falling tiles. If we can carry out repairs to any rendering we will always use waterproof sand and cement which will last longer than ordinary mortar. Replacing pitch roofs is something of a speciality of ours. We have sourced suppliers of the best quality timber, nails, under-cloaking, and tiles available. When your old roof is removed everything that can be recycled is recycled. We try our very best to avoid landfill by taking old tiles to re-claimers and lead, iron and zinc can be melted down and reused. 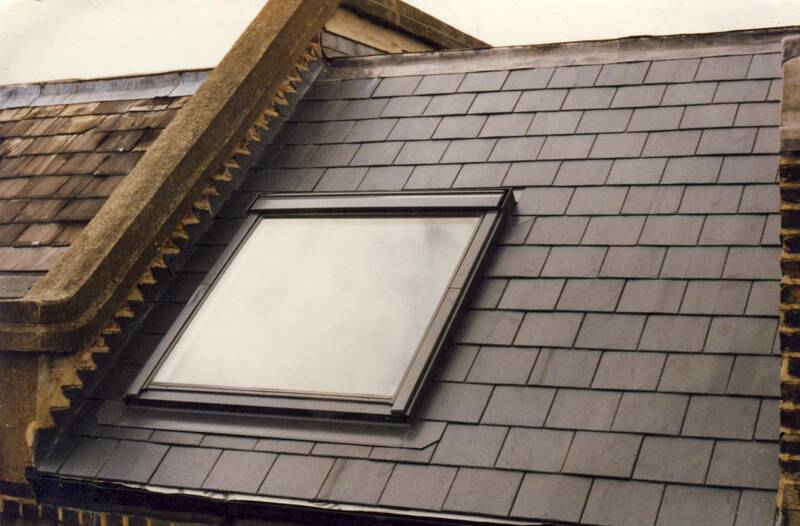 We specialise in supplying and installing Velux Windows with a wide range of options. Whether it is a bathroom, bedroom or stairwell, the more daylight a room receives, the bigger it will feel. The window can open either with Centre-Pivot, Top-Hung or INTEGRA Electric. Centre-Pivot has a top control bar which makes it easy to open even with furniture under the window. Top-Hung open outwards to provide extra headroom and maximises the feeling of space. INTEGRA electric is perfect for out of reach windows such as extensions. There is also a choice of finishes, from the low maintenance and stylish white finish made from moulded polyurethane or classic natural pine with a clear lacquer finish. The –60 pane is recommended for optimal customer benefit, offering enhanced energy efficiency, highest noise reduction, laminated inner pane and clear and clean coating to minimise maintenance requirements. The –73 pane offers improved noise reduction comapred to a standard glazing unit, a laminated inner pane and clear and clean coating outer pane to minimise maintenance requirements. The –59 pane is a cost effective standard glazing option. Velux windows increase energy efficiency and reduce your heating costs.